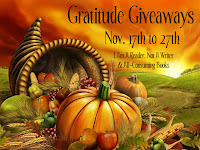 Welcome to the Gratitude Giveaway Hop hosted by I am a Reader not a Writer and All-Consuming Books. Lately I have been thinking of how blessed I am to have 655 amazing followers, and so when I saw this gratitude giveaway hop I just had to sign up. Thank you to each and every one of you for making this blog so worthwhile and a sheer joy to host. Thanks to the generosity of Penguin Publishing Group, I have one copy of Henry Tilney's Diary to giveaway by random selection via Rafflecopter. At the age of four and twenty, Henry is content with his life as a clergyman, leaving his older brother Frederick to inherit Northanger Abbey. But General Tilney is determined to increase the family's means by having all three of his children marry wealthy partners. During a trip to Bath, Henry meets the delightful Miss Catherine Morland and believes he may have found the woman he's been looking for, although she has no great fortune. When the General takes an unusual liking to Catherine and invites her to visit the Abbey, Henry is thrilled. But just as in the Gothic novels Henry loves, not everything is as it seems..."